Well, psychology may give us the answer. 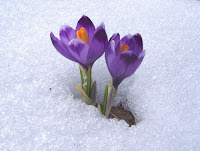 My friend, Anne Gomertz from Gastonia, NC, who is a librarian, tech wizard and expert genealogist, used the term “intermittent reinforcement” to describe what keeps us in the genealogy game. How I put this phenomenon in the context of genealogy is that while we go along, doing our diligent research, including: searching for documents, analyzing possible relationships, tracing migration trails, scrutinizing maps, searching for living relatives, to name just a few activities we do, we sometimes actually FIND something! Now I knew both Henry's and his parents' full German names. I could use his parents' names to search on passenger records. Before I was searching under "John Kreis" (since that was the only name I had) and found no one that seemed to match. But when he immigrated, he was probably using his German name. Was this my Henry using the name "John"? The birth date is close, the birth place matches and his parents birth places match. 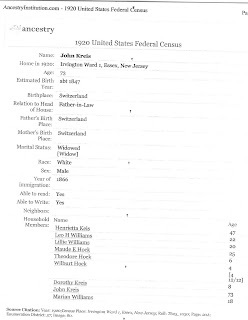 Or a friend and fellow genealogist, sitting by you in a Family History Library looking at the 1920 Essex County, NJ census, figures out the first married name of the head of household that John Kries is living in, and you then immediately recognize her as the character witness in Henry Kreis' first divorce trial. Or a researcher sends us an obituary with the name of a living relative who turns out to be the grand daughter by this second wife, Henrietta, of my great grandfather! 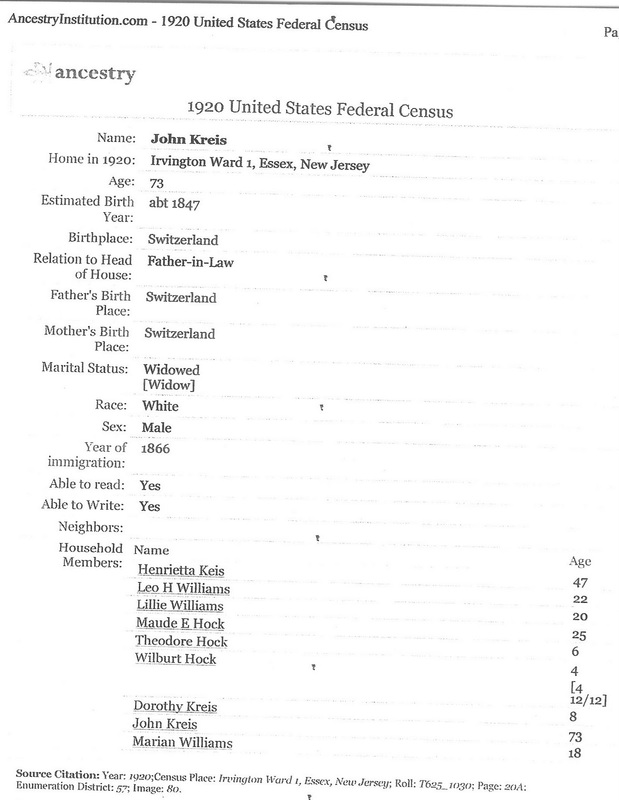 Locating a living relative is a wonderful break for a genealogist. But, a word to the wise is important here. Genealogy is all about our relationship with our ancestors. However, a relationship with people who are no longer on this earth is quite different from a relationship with a living person. When you meet a new person through your genealogical research, you need to follow the same rules of social interaction that govern other meetings. In our zeal to gain information from our new contact, we may be tempted to “hurry” through the initial “getting to know you” stage. But we do the person and ourselves a disservice if we fall into this trap. Taking the time to really learn about someone can be its own reward. After all, we all yearn to “know” our ancestors. Why miss the chance to “know” our living relations? When we take the time to build trust by exchanging personal background information and sharing knowledge we have discovered about our shared family lines, we may make discoveries, solve long standing puzzles, or just make a new friend. I have just started to build a relationship with J.D. 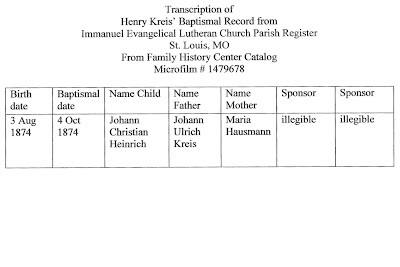 As she is the granddaughter of Henry Kreis and I am his great granddaughter, we are first cousins once removed. J.D. 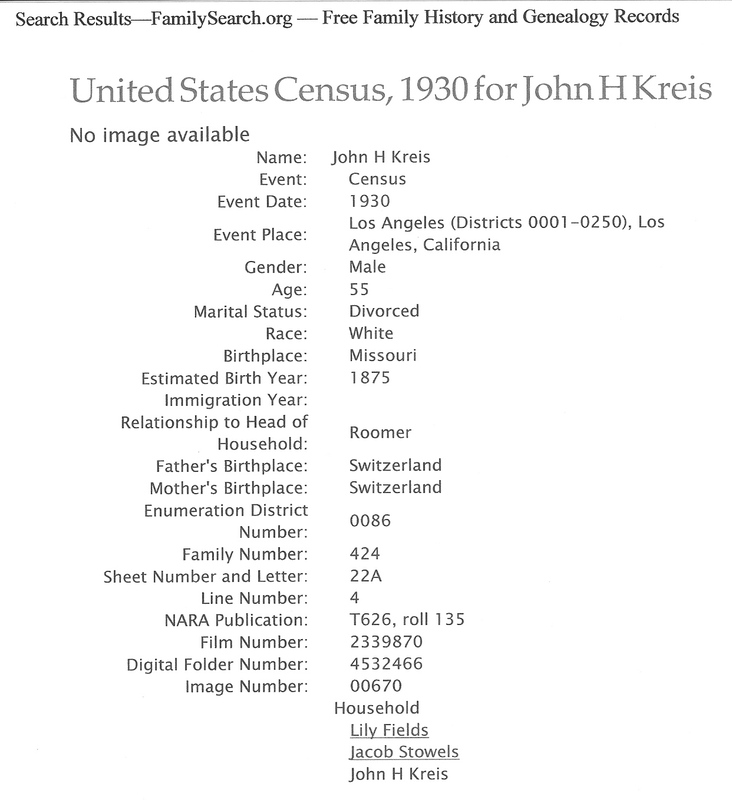 is in her 80s still living in Essex County, NJ where Henry Kreis and his second wife lived in the early 1900s. J.D. was quite surprised to hear from me as she didn’t know I even existed. I first called about two weeks before Thanksgiving. 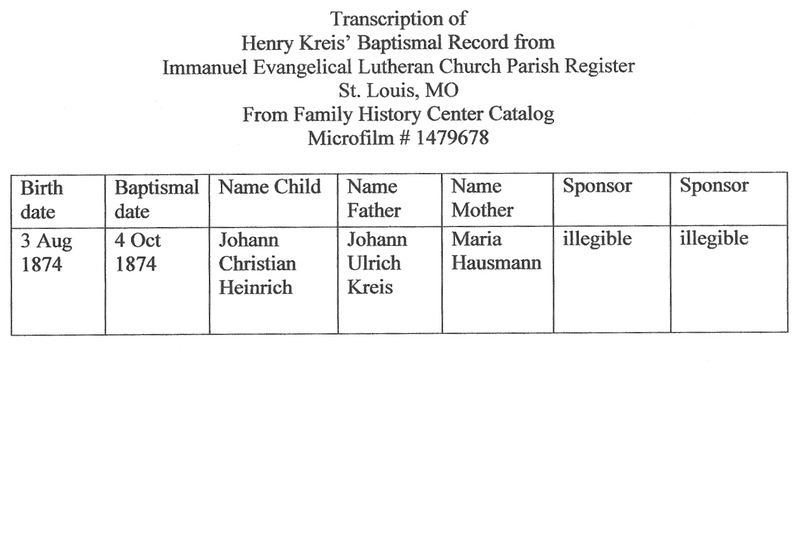 It was a momentous contact for me as she is the only person I know who actually had first hand knowledge of Henry Kreis through her mother and other family members. J.D. told me several facts that I didn’t know. She is the person who told me that Henry went to California in 1929. And she reported that Henrietta divorced Henry. When I later requested the divorce record from Tom Ankner, the researcher I was working with in NJ, I saw that the circumstances of the divorce -- non-support, abandonment, and abuse – were eerily similar to the ones that caused Mary Carney, Henry’s first wife, to file for divorce. So one of my questions had been answered by J.D.’s information. 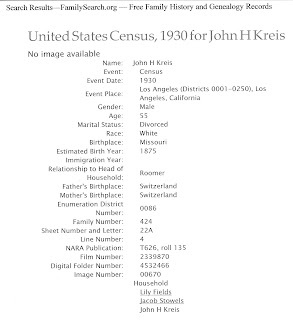 I had wondered why Henry was living apart from his wife in the 1920 census even though Henrietta identified herself as his wife on that same census. Sometimes documents can’t tell the whole story. But J.D. had a surprise of her own for me. She casually mentioned that her mother had left her a trunk full of photos, including one of John Kreis, and his immigration papers!! Now, I could hardly breathe. Other genealogists, the very lucky ones, have come across these “trunks” filled with artifacts. But my family’s records seemed to have disappeared. I had often complained about this to my genealogy friends. I had to remind myself that J.D. didn’t know me and probably wouldn’t want me barging in on her and grabbing that trunk! So, I just thanked her for the information and said that I would send her the documents that I had collected about our ancestors. But this one interaction with J.D. was sufficient to keep me going for many months to come. I would make more calls to her and hope to gain her trust. I think of these occurrences as miracles, but I know that they come from building a genealogical community and sharing information, from regularly searching for documents, from working with professional researchers, and from never giving up! Taken by Szani Uherkovich April 19, 2010 Crocus neapolitanus Used by permission.